Those are the words that someone who bumped into team boss Jonathan France on Sunday afternoon might have used in an attempt to calm him a little, and put a positive spin on what was not one of Embassy’s best results, but was certainly one of its most competitive. Jonathan France was understandably frustrated to see a “comfortable second place” slide into fourth in the final quarter of the hour long race, but after a night’s sleep hopefully he will see how many positives came out of the weekend. 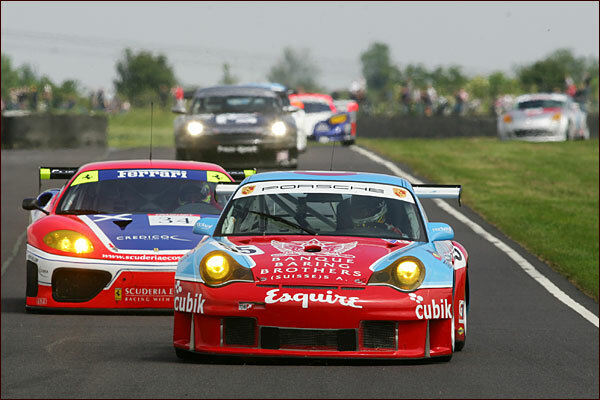 Mullen quickly established the one second per lap advantage his Ferrari had over the Embassy Porsche, but both he and Ben were at times quicker than Andrew Kirkaldy, who led by just eight seconds. With 20 minutes gone, the race pattern looked pretty clear: the Ferraris had a race of their own, Ben Collins had adopted a watching brief on them both and no-one else was even in the hunt, the Jones’ twins Porsche being some 20 seconds further back. It was a tactical necessity, and Embassy was right on the ball. As the Ferraris commenced a slow tour behind the safety car, Neil Cunningham was already jumping into the car and as soon as he was able, he was off in pursuit of the slow train of cars. Next time round, practically the entire field threaded their way down the narrow pit-entry for their driver changes - and Neil took up position as race leader. 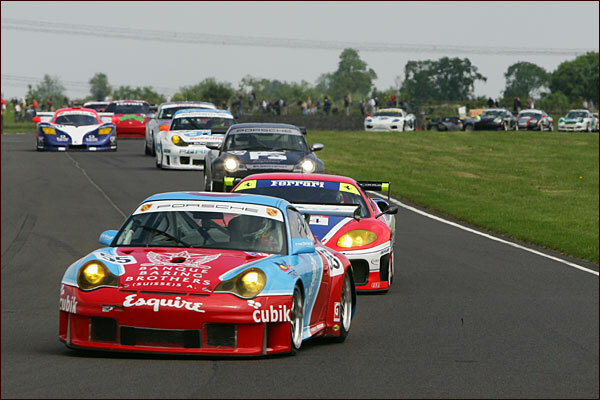 As the pack shuffled itself behind the safety car, it was something of a disappointment to see that Nathan Kinch, having taken over from Kirkaldy, was only separated from the red and blue Porsche by a single back-marker – this would not be easy. Chris Niarchos, in for Mullen, was lurking in the second Ferrari, sandwiching a further three backmarkers between him and his team-mate. With the cars released and half an hour to go, it was explosive stuff from all three drivers, knowing that a moment’s delay in moving through traffic could, and in all probability would, spell a difference in finishing position by the end. 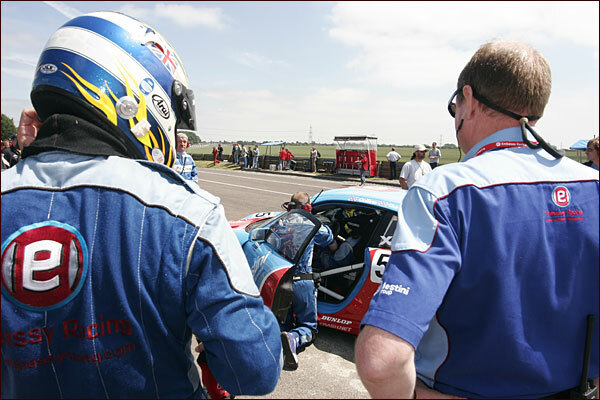 Kinch initially closed up on Neil Cunningham after the first round of traffic was overcome, but then seemed to find it a struggle to lap the RJN Nissan, allowing Neil a brief breather. With just under twenty minutes to go, and all the separating backmarkers dispensed with, it was the Ferrari of Kinch that looked the stronger and with such a quick car, all appearances suggested he was just waiting for his moment. That moment came at Bobbies. 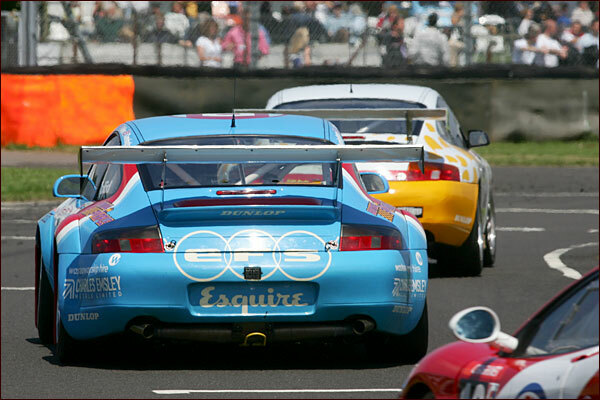 Having run side by side with Neil all the way up to the chicane, he was on the better line and forced Cunningham to brake a little too late, the car squirming under the brakes and leaving the Porsche man with no option but to head across the grass to rejoin on the other side of the chicane. He resumed almost alongside the Ferrari in any event, but the damage had been done, in the form of an 80mph front-splitter-turned-lawnmower. 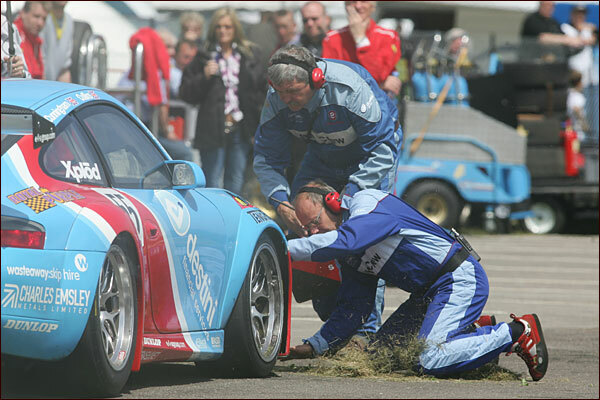 The grass clippings resolutely clung to the grilles around the Porsche’s gaping radiator aperture, blocking the airflow, and as temperatures began to rise, it was a bitter blow to have to bring the car back into the pits to empty the ‘grass box’ – before blasting straight back out to salvage a result. Neil Cunningham rejoined in fifth, but easily made his way past David Jones for fourth with only five minutes to go. That was as good as it was going to get as the clock ran out of spare minutes, with Mike Jordan out of reach, too far down the road. 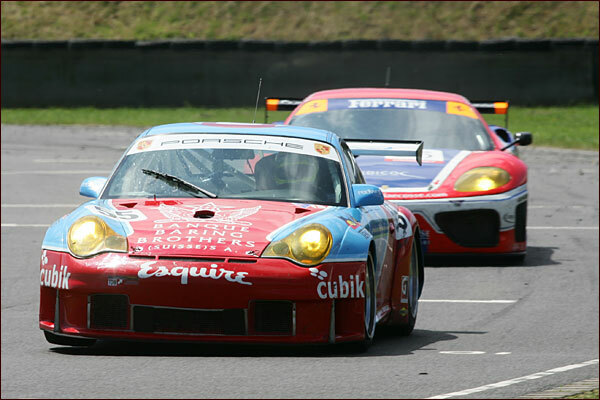 The words of the driver didn’t quite match Jonathan France’s objectives of “making sure we finished ahead of the other Porsches. If we are going to finish second in this championship, and we have to, then we are making life a lot harder for ourselves than we need to. We can beat the Ferraris, we have done, but we can’t afford to take big risks doing it." Despite Jonathan’s frustrations, it was a mighty performance from both the drivers and the entire team throughout the whole weekend. Embassy is certainly closing the gap on the Ferraris and, just as significantly, widening it on everyone else. The challenge now for Jonathan France’s team may well be to overcome the lure of the top step of the podium and rein in his drivers, to consolidate a strong championship position through solid results in the remaining six races.